Fritillaria (Fritillaria): growing, planting, caring. A spring flowering herbaceous bulbous perennial plants and a relative of the lily. 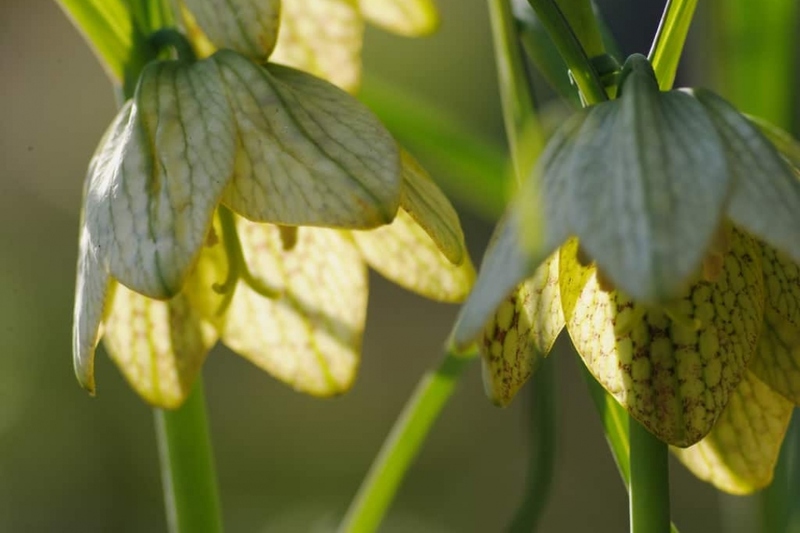 Species of Fritillaria are becoming increasingly popular as ornamental garden plants, and many species and cultivars are commercially available. They are usually grown from dormant bulbs planted in Autumn, and repeat flower every year. The fritillary genus has about 100 species of bulbous perennials from temperate regions of the northern hemisphere. The bulbs carry scales, sometimes cloves. The leaves have a linear or lanceolate shape, and they are opposite or arranged in whorls. The flowers form a flattened cup or a tube, are pendulous, sometimes grouped in whorls. Plant your fritillaries in autumn or spring. They will enjoy a sunny, cool and drained, rather rich location. Add compost before planting if necessary. Indoors, mix fibrous soil, garden soil with sand, and plant in a pot of twenty liters. Place the pot in the light. Plant with an interval of 40 cm for large species, and every 20 cm for small. Mulch right after planting, then water. Fritillaries, once installed - and especially properly mulched! - do not have large water requirements. In pot however, water during the summer season but without excess, once a week if it is very dry, rather in the morning and sparing the leaves. The first year however, watch the weather, and bring some water if necessary. In pots, water when the top of the soil has dried, usually once a week. The easiest way to multiply fritillaries is to recover in the late summer the cloves that have developed in the middle of the roots. To do this, take out the rootball with a spade, divide the clods and replant them every 10 cm. Mulch the base of chrysanthemums, even in pots! This will prevent you from watering and weeding in summer and it will protect the roots from cold in winter.